Hilton Bora Bora Nui welcomes honeymoon couples and other loving guests to the South Pacific of dreams and fantasies. Swaying coconut palms on powder-white sand circle the small island where the hotel is located. More than 100 thatched-roof bungalows stand on stilts out over the lagoon. A ragged-edge cliff towers in the center of the island. Natural elements — weathered wood, white sand, tall trees, moist air, and a warm, piercing sun — create an idyllic refuge. Graceful walkways are flanked by gardens where palm leaves sway day and night in the island’s constant sea breeze. The Hilton Bora Bora Nui staff is as gentle as the view. Ukelele players serenade guests with tunes by the reception area and dock. The property, actually an island off to one side of Bora Bora in the lagoon, is in a stunning notch beneath the island’s craggy signature mountain, Mt. Otemanu. Days pass through every shade of blue in a watercolor set. The night sky is pierced with stars and the Milky Way. On a honeymoon or other special occasion, a visit to the Hilton Bora Bora Nui is unforgettable. Papeete, the capital of French Polynesia’s main island of Tahiti, is reached via flights from Los Angeles, Paris, Tokyo, Sydney, and Auckland on Air Tahiti Nui. In true Polynesian style, a thatched roof tops all of Hilton Bora Bora Nui's guest rooms. Its popular individual overwater bungalows boast glass in the flooring for a bird’s-eye view of the coral reef and its tropical fish below. Even the bath has underwater viewing through a long window alongside it. Garden villas are provided for those who prefer terra firma. Dark wood louvered shades keep harsh sun rays at bay. There are flat-screen TVs, phone, air conditioning and overhead fans, a CD player and internet access (but not wi-fi) in the rooms. The walk-in shower is ample for lovebirds. Mirrors are generously sized and a large one hangs over the tub for two. View the luscious blue lagoon from any vantage point in these rooms, including the sitting area where a second TV and a well-stocked fridge hide behind Polynesian-carved wood doors. A swimming platform below the deck is inches above the water; swim or snorkel any time right out your back door. We woke up the first morning to a lusty stingray lounging within sight. Its sumptuous wings eventually propelled it away, suggesting we should follow. Sliding glass doors promise full views of the lagoon, and most bungalows can catch a tequila-sunrise sunset. Hilton Bora Bora Nui contains two open-air restaurants. A white sand floor is raked like a Zen garden in the Hilton’s moderately priced restaurant where all three meals can be taken. Food is Mediterranean-style with some Polynesian ingredients here and at the fine-dining option a flight of stairs into the hillside. The upscale Iriatai restaurant adds an additional layer of Polynesian elegance to the resort. Oversize chandeliers made of polished Pacific oyster shells glow with a purplish mother-of-pearl iridescence. Iriatai’s menu indicates if meals are local specialties, recommendations of the chef, or suggestions of the spa. Dishes and cocktails feature many Polynesian flavors that include coconut, lime, papaya, mango, and vanilla. The extensive wine list offers everything from Polynesian wine to French Champagne. A wide selection of meat and fish entrees is bolstered by appetizers such as tuna tartare, salmon tempura, and melon soup. Desserts are mediocre but filling. A nightly menu prix fixe is available and a good bet, although coffee and tea are not included. Open to Polynesia’s lovely night air, most tables overlook sunset and lagoon. The sound of swaying palm trees adds to the balmy atmosphere. Local vahine — the Polynesian word for women – dressed in Tahitian print dresses are schooled well enough in sophisticated French service to let you dine in peace. Dress is casual. Breakfast is a buffet with buttery French croissants. A Japanese breakfast of miso soup, fish, vegetables and rice is also offered. Restaurants in the nearby town are an option, a boat ride away. A shuttle boat from Hilton Bora Bora Nui runs on the hour. Note: As Bora Bora is a French island, no tipping is required. Americans traditionally tip, but the French do not. The fine white sand is perfect for a wedding on the beach at Hilton Bora Bora Nui. The property also maintains a small chapel with sweeping views of the island paradise. Hilton Bora Bora will provide white pareos, white flower leis, and other traditional Polynesian attire for the bride and groom to wear during their vows. Couples provide their own bare feet or sandals and flip-flops suitable for a beach destination wedding. The groom traditionally arrives by canoe, while the bride is escorted on land. Tahitian musicians serenade with ukeleles and Polynesian percussion. A Tahitian priest in colorful regalia officiates, and he will inscribe your marriage certificate on bark cloth called tapa. A local Tahitian child sounds the sacred conch shell to seal the deal to the gods. Tahitian dancers can perform afterward to add much color to the photos in your wedding album. For information on marrying in French Polynesia, see this page on destination weddings at the Four Seasons Bora Bora. The Hilton has its own wedding planner who can guide you through the process from the hotel. Its destination wedding package adds a bottle of French Champagne, a romantic dinner, and a pre-ceremony massage. Honeymoon couples are drawn to French Polynesia, and the Hilton Bora Bora Nui provides a magical setting for romance. One word you'll learn quickly here is motu. These are tiny islands in the lagoon. And none is lovelier than Motu Tapu, now owned and maintained by Hilton exclusively. Motu Tapu was taboo in ancient times. It was where the Tahitian royal family had their ritual ceremonies. On the nearly round spit of sand, tall trees offer shade. The Hilton provides a lovely lunch that can be served Tahitian style to honeymoon couples and other romantics. It's arrayed on a pareo held down on the sand with conch shells. For a price, lovers can even sleep on the motu in mosquito-netted royal style. Vaea, an island gal of royal descent from the Marquesas, will attend to your motu needs. The honeymoon need not stop there. A bottle of French Champagne can cool in your room when you arrive. A black pearl can be there too, with two pareos. Dress your bed in a profusion of Polynesian flowers or bathe in a tub of them. Have an outrigger canoe deliver breakfast to your deck. Be advised to book well in advance. Couples can also arrange to have a romantic dinner for two at the far end of the Hilton Bora Bora Nui beach, next to a dramatic outcrop of black volcanic rocks. If you think Bora Bora might be gorgeous but lack enough to do, think again. The Hilton has an array of land and sea activities and excursions. Daily activities range from pareo tying and Tahitian dance lessons to 4X4 treks up into the rugged mountains and an array of water excursions. Be sure to take a trip to the motu. There you can spend a day amid tall ironwood trees and white sand looking out over the lagoon. The hotel provides a lovely lunch. From a perch above the beach, the indoor-outdoor spa boasts a million-dollar view overlooking the water. A traditional Polynesian massage drenches willing couples in a rich oil called monoi (mah-noy) made by local women. Try the one scented by the Tahitian gardenia called tiare. Be sure to take some home. Don’t miss the Hobie cat that can take the two of you to the quiet, white splashes of the outer reef. At a thrilling speed, you will see a waterside view of the island’s majestic Mount Otemanu, the island’s signature ragged-edged cliff that juts high into the sky from the island’s center. Manta rays are sure to accompany you to the edge of their underwater world. The Hilton shop sells beautiful shell necklaces. Next door is a branch of the upscale Robert Wan pearl shop where expensive Tahitian black pearls glimmer in sophisticated settings. Snorkel, swim, relax by day; stargaze at night. We were pleased to see the Southern Cross constellation and to catch a falling star. The Hilton is located on an island off of the main island of Bora Bora, so anything other than the hotel must be accessed by boat. Vaitape (va-i-ta-pay) is the main town on Bora Bora. It is a block-long collection of shops. A covered area for local crafts, the Marche Artisana, provides a colorful photo op that frames a scene of black pearls, shell necklaces, pareos, wood carvings, pretty Tahitian dresses, and Tahitian women with flowers in their hair. Floral adornment is very much a part of Tahitian attire. We marveled at many elaborate head leis, individual crowns of fresh flowers, even on the cashiers at the little grocery store. American GIs made a “friendly” invasion here during WWII and old army bunkers and a cannon from the war can still be seen. Rent bikes, if you like. The main island of Bora Bora is less than 20 miles in circumference. The public beach, Matira, a 40-minute bike ride from Vaitape, is where the locals swim and fish. Villa Mahana is the high-end gourmet restaurant where men must wear a tie. Shorts are not allowed. Bloody Mary’s, owned and operated by a lean, blond ex-pat, is the barbecue grill where celebrities go for local South Pacific color. Fare Manuia in the next town up has a molten chocolate dessert worth the trip. Hilton Bora Bora Nui is an outstanding property, so it is hard to find flaws. But every business does its best to continue to improve. 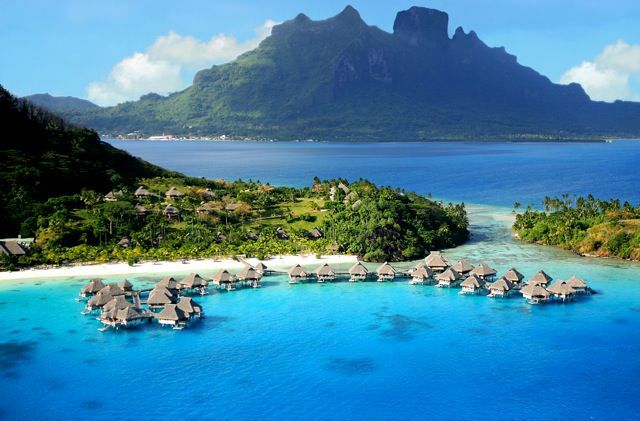 In this vein, the Hilton Bora Bora has an eye to limit its environmental impact. Every bungalow has a solar hot water heater and the hotel makes an effort to keep the coral reef clean. But the hotel has yet to figure out a way to compost their organic material or recycle the plastic water bottles they provide in rooms daily. Our bed was soft by our standards, but our main disappointment was that the sliding glass doors that look out over the Pantone-blue lagoon lacked screens. This forced us to rely on air conditioning more than we would have liked, despite a constant South Pacific breeze outside. Then there's the issue of orientation. The first morning, we took to the lagoon to snorkel off our private swimming platform. The water was vast and luxurious and we lost our way back. As the bungalows are all unmarked, we climbed up several wrong ladders before a fortuitous outrigger canoe on its way to deliver breakfast to a room pointed us in the right direction. The number on each bungalow could be posted, although signage would need to be discreet to conform to architecture so natural. In this spot of French Polynesia, the Hilton Bora Bora Nui Resort and Spa has done a magnificent job of maintaining authenticity both in its environs and its staff. Signage is negligible and lighting is low so as not to interfere with star gazing. The color scheme is limited to what one finds in South Pacific nature: turquoise water, powder-white sand, black rocks, green palms, Tahitian flowers, silvery-weathered wood, and tan thatch. Quiet but efficient staff maintains this natural theme and sets the mood for guests. Though the resort can house many, the vibe is a relaxed and private one. Perhaps it is the intensity of the heat and, to be sure, the intensity of the beauty, but everyone walks around in a kind of dream state. The warm air and tropical breeze, and the Hilton’s spacious layout give guests the opportunity to feel lofty and light. Those who visit are couples or on tours mostly from the United States and Japan. Dress code is pareo and bathing suit, flip-flops and flowers. A pretty little dress that flutters in the breeze will be much enjoyed by new husbands and feel good on new wives. At the Hilton Bora Bora Nui guests aren't obliged to act like native Polynesians of Robinson Crusoe stories, nor are they be expected to keep pace with a jet-set resort crowd. It is hard to muster any pretense surrounded by such outstanding natural beauty. Note: Those who've collected sufficient HHonors points can book a reward stay through the Hilton website. French Polynesia’s main island of Tahiti is reached via flights from Los Angeles, Paris, Tokyo, Sydney, and Auckland on Air Tahiti Nui.